You don’t have to travel far to pick up your pumpkins for Halloween this year. Perkin’s literally has thousands of pumpkins each year. You can even knock out the decorating without making a mess at home. For $10 get a small pumpkin and a decorating kit, and let the kiddos create! Bull City Ciderworks is hosting their 2nd annual CiderJam to kick off the best season. We’ll feast from food trucks, sip on delicious craft ciders and seriously get down with some amazing local artists. Eat, drink and be merry! Octoberfest VIII is coming to downtown Durham. Bull City Burger and Brewery is shutting down East Parrish Street for our annual Octoberfest celebration to raise funds for Habitat for Humanity of Durham. Come by for a family-friendly event complete with live music, a kid’s play area, food, drinks, and great company. Bear Stevens, Boom Unit Brass Band, and Daddy’s Alright will be bringing the jams throughout the day. The kid’s play area will be featuring Balloon Man Mike Party Entertainment who will be twisting up balloons, a craft area hosted by The Scrap Exchange, a bounce house, bubbles, hula hoops, and more. Come by for a day of Fall fun at the Hub Farm! Show up any time between 10 and 2 for tasty food, volunteering in the garden, tours around the property, boating on the pond, programming hosted by DPS students, and a bunch of other outdoor activities! This event is free. Just a short drive away in Rougemont, you can tour the 95-acre Prodigal Farm and milking parlor, play with the wee goats, meet the milking does, and taste nationally award-winning cheeses. American Meltdown will be serving food, and Mystery Brewing Company will be serving beer. Get a tasting glass with unlimited 2oz tastings from over some of the finest beers and ciders! Access into the Art of Beer Experience for beer ingredient samplings, pairings, educational seminars, a mini commercial brewery and more! With VIP access, get a bonus selection of rare and unique beers, and a VIP lounge with air conditioning and real bathrooms. Phoenix Fest is back on Saturday October 6, 2018 from 9 am to 6 pm for its 17th year as Durham NC’s funkiest street music festival to celebrate the cultural legacy of the historic Hayti community and to deliver a fun-filled day of family-friendly entertainment for thousands on historic Fayetteville Street. Celebrate all that’s great and wonderful about Durham’s African American culture by participating in the Phoenix Fest Parade. Enter your church, organization, band, step team or business and show your Bull City pride. Make and take home a great decoration you can use inside or out. This family fun event is open to both young and old and all levels of experience. Materials are included in the price of admission. Class is limited to no more than 20 people. Reservations are required. The Blessing of Animals is an outdoor worship service held each year on the Sunday in October closest to the Feast Day of St. Francis. Last year, Duke Chapel ministers blessed animals ranging from hamsters to horses. The service is open to the public and all well-mannered pets are invited. ** Please consider the wisdom of bringing aggressive animals. ** Parking will be available in the Bryan Center Parking Garage on a first-come basis at a flat rate of $5. People with Duke permit parking passes may park for free in the garage. Handicap parking for vehicles with ADA passes will be available in front of the Chapel. People with animals needing special care may also park in front of the Chapel. The 1970s and 80s were a phenomenal era for horror films, with some of the greatest, scariest, and in some cases, campiest films ever made. This series which showcases 16 of the creepiest horror films. Tickets are just $9.50 per film. Choose from three rides that all end at noon at Durty Bull, followed by family-friendly celebrations! Socialize with community organizations and businesses, including local bike shops, the Bike Co-op, the East Coast Greenway Alliance, and more. Activities will include a roadside maintenance clinic and raffle prizes. Durty Bull is celebrating their second anniversary in the afternoon with tons of festivities: food trucks, live music, new brews, and axe throwing. donation (1-4 cans) from each family – with all proceeds going to the Durham Rescue Mission.Come out in your favorite spooky attire to have great fun for a great cause! Taste fall fruits and veggies from Ungraded Produce, sing and dance around the garden beds to music by The Music Lab with Mr. Steve, learn gardening tips from Durham County Master Gardeners and SEEDS, discover how and why to plant a rain garden with Durham Stormwater Services, play and make art with mud, read a book in the story circle, get the buzz on bees from the Durham County Beekeepers Association, learn about agricultural history with Duke Homestead, and more. This is a free drop-in event, though parking fees apply. Adult chaperone required for children. Climb aboard the Ellerbe Creek Railway for a journey to the museum’s pumpkin patch. Pick the perfect pumpkin to decorate and take home, then enjoy crafts and a variety of carnival games before returning to the station. Trains depart every half hour. Tickets are $15 per person and includes a pumpkin, in addition to general admission to the museum. Children 2 and under free. Visit Historic Stagville to explore the work, food, and craft of enslaved African-Americans during the harvest season on a massive plantation. This year’s event features: Open hearth cooking, brick making, mule cart rides, painting, and more! Tickets are available at the door, $5 per person. Cash or check only. Just a short drive away in Rougemont, you can tour the 95-acre Prodigal Farm and milking parlor, play with the wee goats, meet the milking does, and taste nationally award-winning cheeses. Come as your favorite animal — or as a farmer for Halloween! Stay for goat story time. The Humble Pig food truck will be serving food, Mystery Brewing Company will be serving beer. Mischief, magic, spirits, and fortunes! Enjoy a kid-oriented daytime version of THE popular Halloween Phantasmagoria event with crafts and hands-on activities. Learn all about Halloween history, and what Halloween would have been like for North Carolina kids in the 1870s. Head to the Nasher for a fall celebration and get inspired by local photographers in Across County Lines: Photography from the Piedmont. Create kid-friendly versions crafts, join in the costume fashion show and then capture the memory in their photo studio. Join Paperhand Puppets for a lively and musical parade around the museum. 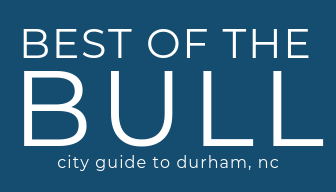 Join Durham Parks and Rec. for an afternoon of doggone good times at Durham Central Park. Local celebrity judges will determine the winner of the costume contests, and you can enjoy treats from local food trucks and brewers while watching canine attendees show off their wooftastic tricks. Join in for the 30th annual Halloween event, an evening full of fun for the whole family! Designed particularly for children ages 12 and younger, this special event features campfire stories and songs, hayrides, treats, crafts, games, and face painting. No need to register – just come out, rain or shine! Bring your kiddos in their best costumes and treat or treat on 9th Street. Perfect for the little ones with a early bedtime. Stop by your favorite shops and get some candy! More than just an audience participation screening, The Carolina Theatre and Retro Film Series present a fully-interactive, theatrical FX-driven, light show-blazing, fog-blowing, call-backing, costume-wearing, motion picture extravaganza! Fasten your garter belt and come up to the Carolina Theatre’s historic 1000-seat lab and see what’s on the slab! There will be door prizes, grab bags, concessions specials, and more fiendish plots than a Transylvanian mountaintop village!